Here’s a great way to enjoy our traditional Besan chila. This recipe is made with besan as the main ingredient with other spices added to it. It is shallow fried making it a nutritious and healthy dish. Besan or gram flour is rich in fiber, iron, potassium, manganese, copper, zinc, phosphorus, magnesium, folate, vitamin B-6 and thiamine. 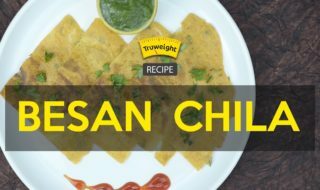 The besan chilla recipe is an instant, nutritious, protein rich recipe ideal for breakfast and snacks. The recipe is part of a weight loss diet that can be savored without any guilt. So, instead of using besan as a face pack, use it as an ingredient in your weight loss diet. Take besan in a bowl. Add salt, chilli powder, ajwain seeds, amchur powder, cumin powder, coriander leaves and required amount of water. Take some amount of the mixture and spread it on a pan as shown. Your Crispy Besan Chila is ready. Serve it with chutney and enjoy!